The Lookstein Center, based at Bar-Ilan University, was launched thirty years ago through a modest, one-time gift honoring the late Rabbi Dr. Joseph H. Lookstein – former Chancellor of Bar-Ilan University and spiritual leader of Kehillat Jeshurun of New York City, as well as founder of the Ramaz School. Rabbi Lookstein was a pioneer in viewing and promoting Jewish education as the key to a vibrant Jewish future. From its base in Israel, Lookstein projects currently include professional development and leadership training programs, curriculum development projects, school evaluation services, an online Jewish academy, and professional publications. 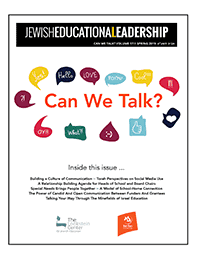 and of course, Lookstein.org, launched in 1998 to address two major needs in Jewish education: the need of Jewish educators to engage in ongoing and substantive reflection and discussion, and the need for access to quality curricular and instructional materials.